There are seven counselling psychotherapy rooms available to rent hire by the session at Ludgate Hill Psychotherapy Rooms. The counselling psychotherapy rooms are furnished with comfortable armchairs and sofas and decorated to provide a comfortable setting for your session. In six of the rooms a sofa or third chair is provided to allow you to use the rooms for counselling couples. In the fifth room a chaise longue is provided to accomodate analytic sessions. Three rooms are on the second floor of the building, four are on the third floor. All rooms have large windows admitting lots of natural light. Two of the rooms have recessed downlights, in the other five there is a choice between low lighting using standing and table lamps, or bright overhead flourescent lighting. The rooms have been soundproofed using recording studio materials and are plushly carpetted. The lift only operates from the first floor. Visitors have to ascend the first flight of steps to the first floor before they can access the lift. Room 2 is to the rear of the building and is very quiet. 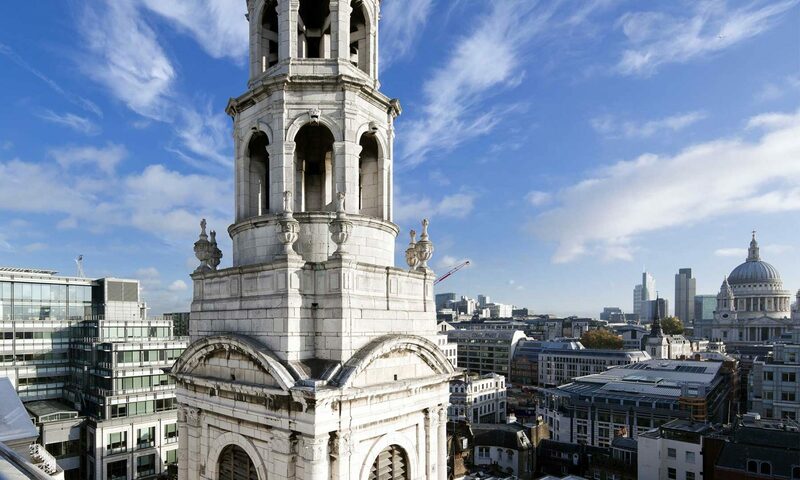 It benefits from a view on to St Bride’s Church and the church yard below. In summer the window can be left open without the noise of the City disturbing the session. The room has two armchairs and an occasional chair. Check the availability of Room 2. Room 3 is to the front of the building and looks out onto the glamorous black and chrome headquarters of Goldman Sachs in Fleet Street. Two floors up the room is quiet and venetian blinds protect privacy while admitting lots of light. Room 3 has two armchairs and an occasional chair. Check the availability of Room 3. Room 4 is to the front of the building, looking on to Fleet Street and towards Ludgate Circus. Room 4 is additionally furnished with a chaise longue for analytic sessions. Check the availability of Room 4. Room 5 is to the rear of the building and is very quiet. On the third floor, it benefits from a view on to St Bride’s Church and the church yard below. In summer the window can be left open without the noise of the City disturbing the session. The room has two armchairs and a three-seater sofa. Check the availability of Room 5. Room 6 is to the rear of the building and is very quiet. On the third floor, it benefits from a view on to St Bride’s Church and the church yard below. In summer the window can be left open without the noise of the City disturbing the session. The room has two armchairs and a two-seater sofa. Check the availability of Room 6. Room 7 is to the front of the building on the third floor and looks down on to Fleet Street. The room benefits from good natural light and is furnished with an armchair and a two-seater sofa. Check the availability of Room 7. Room 8 is to the front of the building on the third floor and looks down on to Fleet Street. The room benefits from good natural light and is furnished with an armchair and a two-seater sofa. Check the availability of Room 8. Please contact me to arrange a viewing of the counselling psychotherapy rooms for hire. Viewing appointments are usually available between 10am and noon.